please can you tell me what this growth is on my Acer. is it fungal? What can I do to make my plant healthy again? 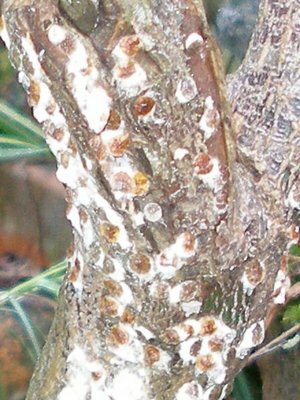 Not fungal, but insect, scale insect. This aphid like creature covers itself with a wax like substance making it hard to kill. You need to use a stiff brush and some horticultural soft soap and wash them off. Do not damage the bark. Or if there are only a few wipe them over with methylated spirits, this destroys the wax and they die of dehydration. Sorry, In Britain it is sold as Winter Wash for fruit trees. You would have to look on the Pest shelves in a Garden Centre/Store for it. If you get really stuck then you can use washing up liquid, but it is not very nice stuff to put on plants!